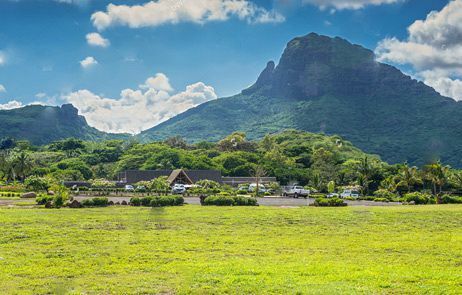 The Casela World of Adventures, repeatedly described as the leading attraction in Mauritius, is a scenic nature park situated besides the Rempart Mountain on the island’s distinctive southwest region. Whether you wish to simply enjoy the company of tamed animals and the outstanding views of Mauritius’ west coast or you are after some serious adrenaline rush, Casela World of Adventures has something special for every type of visitor. The dynamic and vibrant park stands out for its diversity of leisure activities including authentic safari tours, speedy rides on off-road vehicles and extreme adventuress taking you up in the air and above the forested lands. Casela World of Adventures form part of the Yemen Reserve. The 4, 500-hectare reserve hosts two of the longest rivers on the island - Rivière du Rempart and Tamarin River, and is a haven for indigenous and exotic species. Home to Java deer, wild boars, hares, macaque monkeys, mongoose and fruit bats, as well as to ebony, cassias, tamarind and pink pepper plants, be sure to visit the Casela Park during your holiday in Mauritius. Safari Kingdom: Safari Quad Biking, photo-safari, dedicated area for big cats and suitable for safari and interaction with giraffes. Mountain Kingdom: Canyoning, Via Ferrata, zip lines, climbing wall. A day spent in the Casela World of Adventures is a guaranteed time full of excitement, action and amusement. No matter what is your definition of fun, Casela World of Adventures has already figured it out, and is looking forward to welcoming you in its premises. Choose from our complete list of recommended activities especially tailored for every type of fun seeker. 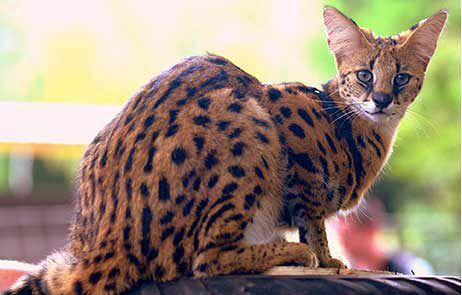 The Casela World of Adventures is famous for its Big Cats troops that include lions, Bengal tigers and caracals. During the Big Cats activities, professional and experienced guides will devote time to share with you interesting information about these magnificent animals and their habitat, as well as share with you their personal experiences on working alongside these amazing mammals. 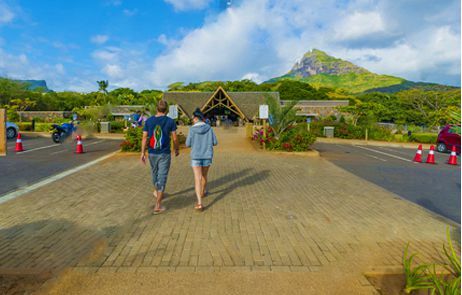 The Big Cats Drive Thru will add a wild African touch to your visit on the island of Mauritius, giving you the opportunity to board on a safe safari vehicle that will take you to the big cats’ grounds. This is your chance to get some once in a lifetime photographs of these fantastic animals. For the visitor who wants to experience the big cats to the fullest, Casela World of Adventures gives you the chance to spend whole 15 minutes inside the enclosures of the big cats while constantly supervised and guided by the passionate handlers. You will get to touch the big cats, observe them closely and appreciate their beauty from very close in this unique Big Cats Interactions activity. Your time with the lions can become even more exclusive with the Walking with Lions activity. Under the coolness of the trees you can take pleasure in viewing the lions from very close, see them playing and hopping on the rocks of the river banks and scaling the trees. The lions roam freely amongst you offering a unique opportunity of being in close contact with them. With the supervision and guidance of the lions’ handlers, you can get even closer, and experience from firsthand how it is to walk alongside the lions, lead them the way and even pet them. If you wish to discover the most of the beautiful nature and wildlife with ease and speed at the same time, take the opportunity to jump on a Segway ride for a Segway Safari Trip. The operation of the electric vehicle is as natural and intuitive as walking. The Segway will take you for a unique discovery of the wildlife seeing Java deer, wild boars, hares, macaque monkeys, mongoose, zebras, ostriches, African antelopes and fruit bats. Abundant indigenous and exotic plants such as ebony, cassias, tamarind, pink pepper and many more grow in this amazing reserve and can be seen as part of the Segway trip. For an even more resting maneuvering way around the park you can opt for the Safari Quad Biking trip. During the ride look at the surrounding for the deer, zebras, ostriches, African antelopes, wild boars and many more animals. The course takes you up the park heels, down some valley and across rivers. Those who want to enjoy the experience with more privacy and at their own pace, can go for the Exclusive Safari Quad Biking. The Casela World of Adventures also operates Horse Safari that is meant for those who want to discover the nature at their own paste on the back of calm and friendly beautiful horses. Of course, you won’t be alone on this expedition but you will be accompanied by the professional staff throughout the full duration of this activity. Have you been wondering how does it feel to mount a camel? The Casela World of Adventures brings to you the majestic animal of the deserts for a unique safari experience on the back of a dromedary (or also known as Arabian) camel. Enjoy peaceful moments amidst the reserve and bond with the camels with this amusing Camel Riding safari. The Casela Park is also home to a whopping nine giraffes, and through the Giraffe Feeding encounter you will get to meet them, admire their tallness and elegance and even spread your palm and feed them. We ensure you that the giraffes will love you back and are very keen to pose for selfies. Casela World for Adventures is meant for animal lovers. Those curious to see how a one ton heavy animal looks like can attend the 15-minute Interaction with Rhinos inside the enclosure. Always accompanied by the enthusiastic carers, you will enrich your knowledge about these charming beasts of the Rhinocerotidae family. A full day of exciting safari adventures can easily be achieved with the one-day package Safari Adventures Day. During your visit at the Casela World of Adventures you will get to combine the most fun and interactive activities that the park has to offer, all in one exciting day. You will take the lions for a walk; have a Rando Fun Adventure of ziplining; enjoy exhilarating quad biking and see many other animals and breathtaking natural sceneries. The most beautiful reserve of the west coast of Mauritius can also be experienced in the very alternative way of Mud Karting. Enjoy 20 minutes of fun-packed Mud Karting experience, alone or with a co-passenger, in the off-road circuit track. Full of twists, turns, overtakes and speedy straights, the track will truly test your handling skills and will bring out the inner pro-off-road driver. From the start till the end, enjoy fun and crazy high-powered Mud Karting but rest assured that you will stay protected with full safety harness, special clothing, waterproofs and helmets - all provided. In the Casela World of Adventures you can fly zipped in the air above the beautiful forests of the very south of Mauritius. The zipline activity is ideal for everyone who is always in search of new adventures and desires an adrenaline rush. There is nothing quite like this thrill to break your daily routine! You will also be brought to walk on the Nepalese Bridge and have a full perspective on the beautiful surroundings. For more memorable moments, Casela World of Adventures will introduce to the Canyon Swing - a different type of bungee jumping. Once equipped and briefed on the safety measures, you are all set to fly between the canyons. Jump from the 45m high platform and dive into an authentic canyon among birds and maybe bats. The Rivière Papayes canyoning trip gives you the opportunity to discover waterfalls and crystal clear ponds of Rivière Papayes. 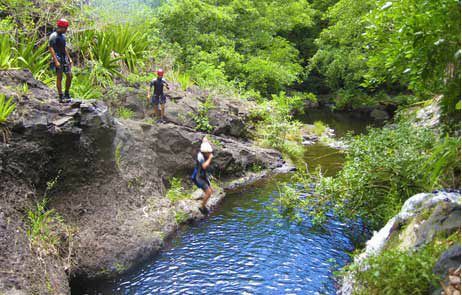 The trail consists of several abseils, and it also offers to enjoy some river trekking and swimming in the river. Abseil down from 5 to 20 meters height and discover the “3 Canyons du Rempart”, which include Papaye River, Rempart River and Trou Pigeon. The grand finale can be a rewarding and refreshing swim in one of the numerous waterfall pools. So, if you are panting for an adrenaline rush, Canyoning is the activity to satisfy your bravery and courage. Probably the park’s most sporty activity is the Via Ferrata Circuit that opens your way to cross cliffs, gorges and plateaus. The excursion is fully supported by high-standard safety equipment and experienced guides, who are there to offer a helping hand whenever needed. The extraordinary journey begins with the climbing towards the peak of the Mamzel Zabeth Mountain. Prepare yourself to stand up there stunned by the panorama view of the nature reserves, lagoons and of almost the entire west coast. Crossing a hanging bridge and swimming in natural pond of fresh water alongside a waterfall will add to your excitement. You can even slide on the water ziplines that will take you from the top of the hill directly into the pond - with a big fun splash of course! The Casela World of Adventures is especially looking after its young visitors, who are given the opportunity to go behind the scenes and become zookeepers for a day. The Zookeeper for a Day Kids Package gives the chance to all children between 8 – 14 years old to spend half a day in the different sections of the park and take part in vital activities, such as food preparation, food distribution and observation of the animals. The children will experience the duties of a zookeeper and will be sensitized about the protection of the biodiversity that includes birds, lions, tigers, zebras, ostriches, giraffes and many other African animals. Exclusively for children under the age of 12, the Pony Ride is a journey that starts from the goat enclosure and continues to the pigs, the fawns and calves. The ride is supervised by a professional staff member, who ensures that your child will spend a safe and memorable time with Casela’s lovable animals. Let your children grab a fishing rod and demonstrate their fishing skills around the pond that is thriving with tilapia fishes. The Tilapia Fishing activity promises 30 minutes full of peaceful and fun time. But it’s alright if your child is more fond of the skies and birds. Head to the aviary where feathery creatures from Latin America, Asia and Africa live happily together. The bright colors of the macaws will undoubtedly move your senses, and so will the synchronized flying parades of the blue-collar parrots. Recognizing the personal needs and expectations of each visitor, the Casela World of Adventures offers a Tailor Made Casela Day Package. You can benefit from maximum flexibility by creating your own customized program of fun and exciting activities - all pre-booked and organized for your maximum satisfaction. You can also add to your package a delicious lunch at the park's restaurant and/or a pick up and drop off service from your place of accommodation. If you have difficulty choosing the right activities for you from the so many options available, then, maybe you should opt for one of the Casela Park’s pre-picked Theme Packages offered each at a discounted rate. Now, with the meticulous guidance of Casela Park’s experts, you can choose from five pre-picked theme packages based on your personal needs and the type of experience you are looking for, while benefiting from a special 30% discounted package price! All the Casela Packages are offered at a discounted package price of 30%. 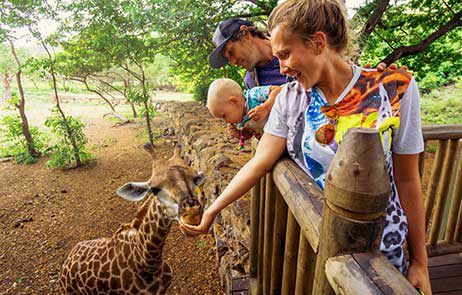 All the packages include the Casela Park’s Entrance, on all the many activities and faculties included in the entrance price, such as: Photo Safari Bus Trip, Avalanche Mine Adventure, 3D Interactive Map, Walk Thru the Aviary, Big Cats Viewing, Giraffe Viewing, Camel Viewing, Kid’s Playground and Petting Farm. Note: The Casela Park Theme Packages are not available on Sundays. Toboggan: a thrilling fun ride on the first toboggan slide in Mauritius. The toboggan includes two slides on a slope from where one slides with buoys. Walk Thru Aviary: Walk through the bird aviary and interact with various colorful bird species from around the world. Photo Safari: This great value tour brings you face-to-face with zebras, ostriches, deer, African antelopes, white rhinoceros, impalas and kudus during a unique safari tour on-board a safe safari vehicle. Big Cats Viewing: For big cat lovers this is a dream come true! Visit the Big Cats’ Park to enjoy a close view of the lions, caracals and tigers. Giraffe Viewing: Come face-to-face with majestically animals for a unique viewing experience. Camel Viewing: Meet the camels - one of the friendliest and most loving animal you will ever meet. Kid’s Playground: A new kid’s playground that will offer sensation to the young ones. Petting Farm: Ideal setting for people of all ages - especially children - to interact with farm animals. 3D Interactive Map: Discovery of natural science and the history of Mauritius through giant 3D Maps. For the convenience of the visitors, the park offers facilities such as a restaurant, children mini-club (games, slides, swings etc. ), snacks bar and souvenir shops. The restaurant represents infusion cuisine with dishes from Asia, Europe, and Africa, as well as locally inspired flavors. Enjoy a delicious lunch or celebrate your special event (engagement, wedding, anniversary, birthday etc.) with a breathtaking view to the Tamarin Bay. The restaurant is child-friendly and it features a la Carte Menu. The customers in a hurry can have takeaways. If you don’t want to waste a moment of exploration, you can eat gourmet baguettes, burgers, light sandwiches, wraps and hot dogs on the go. The first thing you would like to do after you have completed your activities at the Casela World of Adventures is to keep the memories alive forever! Visit the Safira Boutique (located at three different outlets) for a selection of gifts and souvenirs - from gizmos and shirts to hats, bags and mugs, you will find it all there. Casela probably has its name origin from “la case la” meaning house in the local language. It opened its doors in December 1979 as a bird sanctuary. Casela, part of Medine group - a major conglomerate in Mauritius - was a vision that took shape and concretized beyond the expectations of those who, for the love of nature, refused to have those beautiful trees cut but had them integrated into the creation of a garden at that time. The various amenities and activities recently introduced at the park are testimony of the innovative spirit driving the team. The Discovery Centre, a magnificent building at the entrance of the park sets visitors in the mood as soon as they step out of their vehicle. The peculiar roofing at the entrance, along with imposing statues of animals, is a must-take photo spot! Massive pillars replicating giant baobabs and creepers on the ceiling add an adventurous touch to this building with the ming signed by the illustrious company which was hired for the world famous Games of Throne series. Fitted with the very first 4D cinema on the island, two movies are on display. A made-to-scale replica of the map of Mauritius in 3D is also centrally placed so visitors can situate themselves. Several interactive buttons enable visitors to discover the island’s leading landmarks in a fun way. Casela World of Adventures, accredited as a member of the Pan African Association of Zoos and Aquaria (PAAZA) enjoys manifold privileged exchanges with parks and zoos in parts of the world. In 2015, Luna and Athena, two pigmy hippopotami, from Czech Republic and Greece, respectively, were welcomed at the park. On that same year, two white rhinoceros from South Africa were successfully brought to Casela. True to its founding vision, Casela World of Adventures is more than ever involved in the conservation and protection of endangered species. In February 2015, the park ensconced its notoriety as a major player, counting Her Royal Highness Princess Stephanie of Monaco as the new patron of the park. Princess Stephanie, known for her involvement in the protection of elephants in Asia fully espoused the efforts of Mauritius’ number one visitors’ attraction. The latter has witnessed hundreds of journalists flocking from various countries to visit this remote haven. Activity Time: In summertime- from 9:00 am to 6:00 pm and in wintertime- from 9:00 am to 5:00 pm. The Casela Park Theme Packages are not available on Sundays. Bring along: mosquito repellent, comfortable clothes, sportswear and changing clothes just in case.